The Asian travel explosion is almost as prolific at producing new hotels as it is at producing new international travelers. The following hotels reflect new developments in ocean front resorts, in culturally sensitive towns in the interior and in city hotels. Some of the players are old and some, like Sun Siyam Resorts, are just setting out. Using an idea as old as Balinese civilization, the Mandarin Oriental, due in 2016, is being built on a series of elevated terraces overlooking the Indian Ocean from Bali’s Bukit Peninsula. Each of the resort’s 24 rooms and 97 villas will have their own pool. The clifftop location helped the architects create a series of dramatic public spaces with both a clifftop restaurant and a clifftop ceremonial platform that can be used for destination weddings. The resort will also have a 1,725-square-meter spa with eight treatment rooms, heat and water therapies and a 100-meter outdoor pool surrounded by a number of private lifestyle cabanas. There will also be a beach club, kid’s club and an 18-hole golf course adjacent to the resort. Ubud is an art-oriented community in the center of Bali and by year’s end it will have a new Ritz-Carlton Reserve situated alongside the Ayung River, with views of the terraced rice paddy fields adjacent to the village temple. The resort, which will have 60 villas and suites, will be dotted with gardens, meditation areas and meandering pathways that are designed to follow the natural lie of the land to two swimming pools that have been designed to offer guests private day space, including personal sun loungers. There will also be such Western touches as dedicated butlers. Out in the Indian Ocean, a new hotel brand is launching its first property and its flagship. 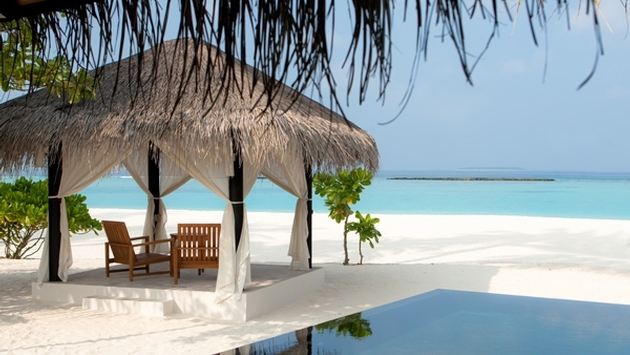 The Sun Siyam Iru Fushi reopened on Feb. 21 under the new Sun Siyam Resorts banner. The new-look Iru Fushi is the first Sun Siyam property, the premier brand of Sun Siyam Resorts that also includes the boutique ‘Beach House Collection’ and the Sun Ray brands together with five further luxury resort openings planned, across three countries, in the next few years. Located in the Noonu Atoll Maldives, the Sun Siyam Iru Fushi has 221 luxury ocean-front villas, including 70 over-water bungalows, 11 bar and restaurant choices and a 20-room tropical spa. Guests may tailor their stay with their own choice of pillow and fragrance menus while ‘Retreat’ accommodation guests receive the added benefit of a foot massage on arrival and services of a 24-hour butler. The resort’s 22 new Deluxe Beach Villas bring the total to 44, each with private pools. The Spa has enhanced its offering to include traditional Chinese medicine and Maldivian treatments. The food and beverage menus have seen the introduction of new dining experiences that include an ice-cream parlor and ‘destination dining’ options. The resort is also now home to a dedicated family dining area. Noonu Atoll is a 40-minute seaplane journey from Male. The resort features a PADI five-star dive facility and a water sports center, tennis and badminton courts, kids club and multiple swimming pools. The resort offers a choice of 11 bars and restaurants. Luang Prabang’s Maison Dalabua Hotel has completed a seven-month renovation program. The 18-room boutique property is located in central Luang Prabang near the Royal Palace and the Night Market. The facelift has included the installation of a new reception, an upgrade of the bar and restaurant area and the installation of a larger wooden platform with more sofas and seating capacity. All the rooms have been repainted, the furniture re-varnished and a textile decoration theme added throughout. The three new private bungalows overlooking the lotus ponds have also been completed. In 2017, Kuala Lumpur will open Malaysia’s first hotel from Fairmont Hotels and Resorts and it will be a large one at 750 rooms. The hotel is being built in KL’s city center not far from the Petronas Twin Towers – the tallest twin buildings in the world. The 62-story hotel will offer an executive lounge and Fairmont Gold, the luxury brand’s hotel within a hotel offering. Fairmont Kuala Lumpur will also feature six dining outlets, a pool, health club, and spa. The hotel is also near the Kuala Lumpur Convention Center and nearby offices through a covered walkway. Fairmont will be adding still more to its Asian inventory with openings coming in Chengdu (2015), Jakarta (2015), Bali (2016), Taiyuan (2016), Changsha (2016), and Hangzhou (2017). Langham Hospitality is pursuing an aggressive expansion in China. The opening of the 327-room Langham Place in Xiamen marks the ninth hotel in the People’s Republic. It’s the third Langham Place hotel to open in the last three months, after Guangzhou and Ningbo, both recently opened. Located in Xiamen’s city center not far from the city’s newest luxury fashion and shopping area. Located on the top two floors, the Club L guestrooms give guests access to a two-level lounge with views of the city skyline. In addition, Club L guests receive an extra level of personalized service and privileges including complimentary breakfast, afternoon tea, evening cocktails, and the use of the boardroom for meetings and business gatherings upon request. The Chuan Spa’s treatments are based on Traditional Chinese Medicine (TCM) using the five elemental forces of fire, earth, water, metal, and wood. The spa offers nine treatment rooms and one dream room including one specially designed for couples. Other recreational facilities include a fitness center equipped with the latest workout equipment, and an indoor heated swimming pool with natural light and an underwater sound system.